Home Basic Accounting What is Balance B/F and Balance C/F? In bookkeeping, Balance B/F and Balance C/F are a couple of accounting jargons used while journalizing. They play a role during totalling and carrying forward of balances from one page of the journal book to the next one. To understand balance b/f and balance c/f begin with understanding carried forward first and brought forward next. The journal book maintained by a business includes many journal entries, due to a large number of entries multiple pages of the journal book are used. 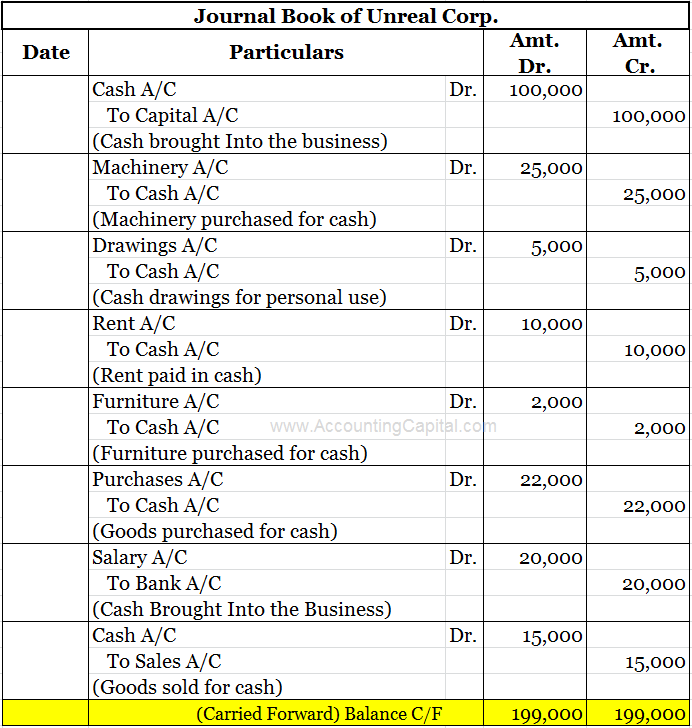 At the end of a journal page the debit and the credit balance is totalled and carried forward to the next page, this balance pushed forward from the current page to the next page is termed as “Balance C/F” or “Total C/F” (Carried Forward). 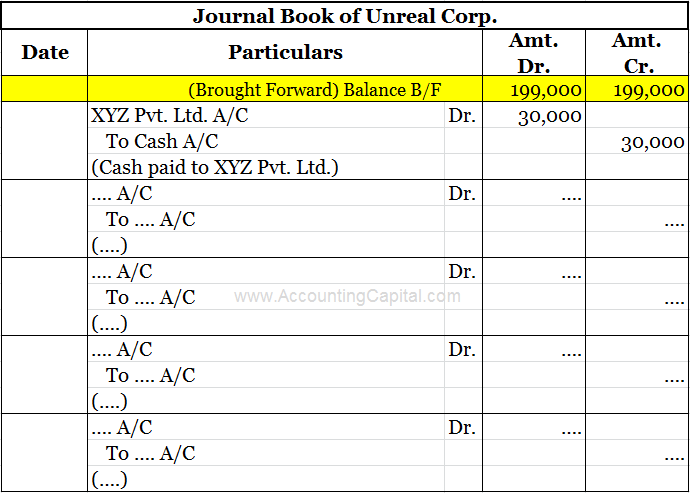 Below is a sample of journal book for Unreal Corp.
Highlighted in yellow is the total of both debit and credit side on this page of the journal book, this balance will be carried forward to the next page & should be treated as the opening balance of the next page. Related Topic – What is Bookkeeping? At the beginning of a new journal page, the opening balance is quoted from the previous page, this balance pulled forward from the previous page to the current page is termed as “Balance B/F” or “Total B/F” (Brought Forward). Consequently from the above example when Unreal Corp. moves to the next page of its journal book it will bring both the closing debit and credit balance from the previous page. Balance B/F & Balance C/F is used in journal books whereas Balance B/D & Balance C/D is used with ledger accounts.